The art of lacquer has long fascinated me. When I was in an Asian Art seminar in college (decades ago), I learned that ancient Chinese bodies coated in lacquer still had supple skin. Now that’s amazing. It is a remarkable material that is used to give a lustrous and durable surface to a myriad of objects, obviously including the human body in ancient days. Lacquer is the sap derived from a tree (called “uroshi”) in Japan. Lacquer is a natural plastic, resistant to water, acid, and heat. When the sap is collected, it is heated to remove impurities. The purified lacquer can then be applied to any surface. The Chinese even coated deceased members of the nobility to preserve the physical body. High-quality lacquer may require as many as thirty to forty coats to achieve a durable finish. The lacquer technique in Japan was imported from China, although the Chinese were unique in their heavily built up surfaces of carved lacquer. 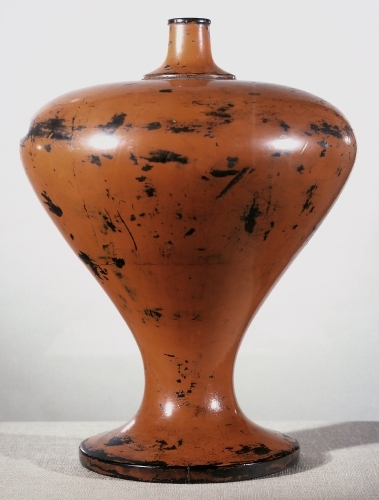 Japanese artists preferred to emphasize the shape of the object with subtle tonal variations in the lacquer. The Japanese were using lacquer as early as the Jomon Period (ca. 1500–200 bce) to decorate pottery. They did not start evolving sophisticated lacquer pieces until the Nara Period (645–794 ce). Originally, lacquer was used on common objects such as boxes, combs, and small household shrine objects as a way of protecting them from wear. What’s interesting is that in Japan lacquer then evolved as a medium to represent the Zen Buddhist idea of the transience of life. This beautifully turned wooden vessel exhibits the two major colors of lacquer available at the time: black and red. Black was applied first with a layer of red over it. It was not applied thickly, because of the desire by the artist to see the eventual wearing down of the red layer with the black layer peeking through. This is the unplanned, spontaneous nature of Zen Buddhism that emphasized being ready to welcome Enlightenment at a moment’s notice, regardless of how unprepared they felt. Negoro ware originated from a monastery in Japan’s Kil Province that flourished in the lacquer production during the 1300s to 1400s. The sake bottle would have been for the priest’s own use. Sake was important during the Buddhist wedding ceremony, much like wine is in Christian weddings. Negoro ware was greatly prized for its seeming antiquity, due to the erosion of the red (vermilion) overglaze. Westerner’s were greatly intrigued by the unique, durable quality of lacquer, but never quite perfected the technique, as the uroshi tree did not exist in Europe. Shellac or varnish from the sap of pine trees was used in multiple layers, especially furniture, to imitate Japanese lacquer with painted and gold leaf designs underneath.